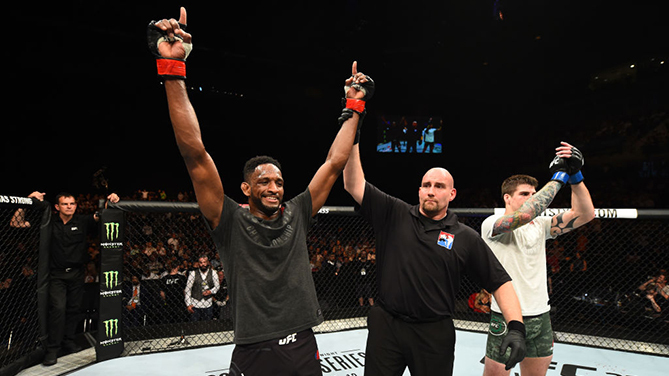 Veteran welterweight contender Neil Magny moved into third place on the UFC’s all-time welterweight win list with his 14th Octagon victory, as he halted British newcomer Craig White in the first round of their UFC Fight Night co-main event at Echo Arena in Liverpool. After the two battled in the clinch against the fence for much of the first three minutes, Magny and White tumble to the canvas with Magny on top in the mount position. Magny stood up and scored with some strikes on his grounded foe until the fight was restarted. White rushed Magny and pushed him to the fence, but when Magny reversed position, he scored with a knee to the face that dropped White. Magny went on the attack with his ground strikes, and referee Leon Roberts intervened, halting the bout at 4:32 of round one. With the win, the No. 9-ranked Magny moves to 21-7. White, who replaced the injured Gunnar Nelson, falls to 14-8. Just when it looked like Denmark’s Mads Burnell was about to pick up a big win against Arnold Allen, the Brit turned the tables in the final round of the featherweight matchup and scored the comeback victory via submission. It was a fast-paced and competitive first round, Allen using a stick and move strategy effectively while Burnell still found a way to get his licks in and score a couple takedowns before the horn sounded to end the frame. Burnell opened the second with a takedown and while Allen ultimately found his way back to the feet, much of the battle in round two was waged on the mat with Burnell controlling matters there. It was back to the mat to start round three courtesy of Burnell’s takedowns, and though Allen kept getting up, he was digging himself a hole on the scorecards. Then again, Allen wouldn’t need the judges to get involved, as he suddenly sunk in a front choke that produced the tap out at 2:41 of the final round. With the win, Ipswitch native Allen moves to 13-1. Burnell falls to 9-3. After more than a year away, “Mr. Finland” returned with a victory, as Makwan Amirkhani scored a split decision win over Jason Knight in a featherweight bout. Turku’s Amirkhani (14-3) got Knight’s attention in the first minute with a right hand, but a subsequent flying knee attempt came up empty, prompting Knight to pull guard. As the two hit the mat, Amirkhani fired off ground strikes and taunted his foe before standing up. Two more right hands drilled Knight, who was showing blood on the bridge of his nose and over his left eye. But with 1:15 left, a right uppercut by Knight put Amirkhani on the seat of his pants. Knight flew in, looking for a rear naked choke, but Amirkhani pulled free and got back to his feet. The two traded, with another right by Knight decking his foe again. Knight looked for a submission from his back, but he wasn’t able to keep it secured. Mississippi’s Knight (20-5) took over the gamesmanship in round two as he trash talked Amirkhani, and while he piled up the verbal attacks, he also was the busier fighter in the first half of the frame, a run only interrupted by a takedown from Amirkhani midway through the round. The two didn’t stay grounded long, but Amirkhani did score another takedown late. The pace dipped in the third, but Amirkhani’s takedowns and control on the ground allowed him to take the round and the decision via scores of 29-28 twice and 27-30. Three and a half years after his last UFC bout, welterweight Claudio Silva picked up where he left off before his injury-induced layoff, extending his winning streak to 12 with a first-round submission victory over Nordine Taleb. It looked like it might be a rough night for the Brazilian early on, as Taleb coolly eluded the aggressive rushes of Silva and even scored with a thudding throw in the second minute. But just past the midway point, Silva got the fight to the mat and soon worked his way into the mount position. Taleb tried to escape, giving up his back, and that where Silva sunk in the rear naked choke that ended the fight at 4:31 of round one. With the win, Silva ups his record to 12-1. Taleb falls to 14-5. The fifth time was the charm for London middleweight Darren Stewart, as he put an 0-3, 1 NC start to his UFC career in the rear-view mirror with a second-round stoppage of Eric Spicely. Both fighters got their cracks in as the bout got underway before Spicely locked up with Stewart against the fence. The New Englander sought a takedown, but when that came up empty, he separated from his foe and the two got back to striking from range, with Spicely able to land some solid overhand rights and a left hook. Stewart rocked Spicely early in round two with a right hand, but after some dicey moments, Spicely was able to recover, nailing his foe with a right hand of his own to slow down the forward progress of “The Dentist.” But it was only a momentary reprieve, as Stewart sent Spicely to the mat with a left hand and then finished him with ground strikes. The official time of referee Leon Roberts’ stoppage was 1:47. Stewart moves to 8-3 with 1 NC with the win. Spicely falls to 10-5.